FRIDAY JANUARY 19, 2012 // HIVEALIVE! We are now endeavoring an intricate floor pattern, a soft foundation to support our inflatable shelter! The unveiling will be January 24, 2013 at the opening reception for Alternative Visions/Sustainable Futures (808 Gallery, Boston University), so we are leaving some details to surprise. 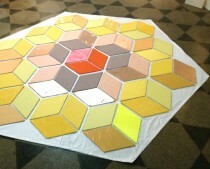 Moveable hexagons will be attached so that they may be rearranged, forming new color combinations and patterns for different contexts. These pieces can be used to diagram performances and organize social exercises that mirror honey bee-havior. We are pretty pumped for this and will continue to share progress within this part of the building phase! SUNDAY NOVEMBER 25, 2012 // Unveiling! THURSDAY NOVEMBER 15, 2012 // Icing on the Cake! Our kickstarter campaign has closed as a huge success! Having surpassed our goal by nearly $1,000, we quickly jumped to place orders and make pilgrimages, collecting the fabrics we’ve been drooling over. Adding to the warm yellow and gold on our wish list, this budget allows for an icing on the cake. We’d hoped to purchase a very special “Flourescent Lemon” to cap our beeautiful dome and thanks to our supporters, our sweetest dreams are being realized. 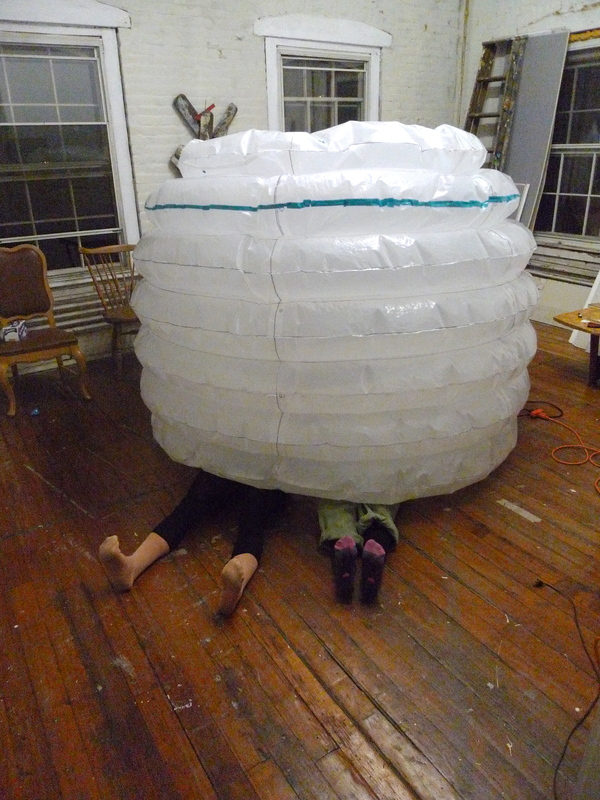 There is an incredible amount of work to do before Festooning debuts at Boston University’s 808 Gallery. We are ever thankful to Marty and Brad of Geekhouse Bikes for offering a lovely home for our building process. We were really in a bind and they came to the rescue. Here are some photos of our recent progress at 12 Channel. It feels wonderful to be knee deep in yellow fabric rather than painters’ plastic. Patterns posted. Seam rippers drawn. Coffee brewin’ Here goes! Sneak peek inside the 1/3 scale model! After a bit of trouble shooting and a helpful visit from friend and collaborator John Osorio Buck, we figured out a good way to channel air equally into the top and bottom of our half-scale model. So psyched to be able to climb inside, we thought we’d share some photos with you! After months of buzzing around with our design and programming we have now launched our Kickstarter for Festooning the Inflatable Beehive! Please stop on by our page and watch our lovely video as well as peep at some of the rewards that involve t-shirts, honey inspired meals, and tickets to future events within the finished inflatable. Like a ticket to the first in a series of inflato-lectures and workshops, “Honeys of the World”. Colette will offer her knowledge on various honeys, offering samples so you may experience the variety of tastes, colors, and textures brought to this product by a range of floral sources. OR an Intro to Beekeeping class and honey tasting with Maria at her new hives or honey from her next harvest! Human Protractor night in sübSamsøn. Maria and Colette work on 1/4 of a half-scale model using the corner of her studio to build a armature.Check out the video and click HERE for more images! Untitled from Maria Molteni on Vimeo.